Lyceum Education Centre Pty Ltd was established in 1995, initially trading as Lyceum Language Centre offering LOTE courses to Australians. The school grew to include courses in Italian, French, Spanish, German, Japanese and Chinese. 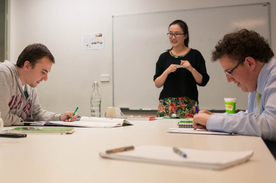 At Lyceum, Chinese is taught using the communicative method, meaning that there is a very strong focus on the spoken language as it is used in practical everyday situations. The characters used in written Chinese are explained, and teachers discuss the most essential ones however, the majority of class time is aimed towards achieving fluency in speaking.